This month the Belgium Air Force 349 Squadron, based at Beauvechain AB, flying the F-16A, held a squadron exchange with the F-104G operating 141 or 142 Filo at Murted AB. Sadly this was a one-way exchange without having Turkish Starfighters in Belgium. Only the Belgium F-16 squadron flew to Turkey. Note: There are two references published in Belgium and one mentions 141 and one mentions 142 filo. Hopefully one day someone can confirm the correct unit. 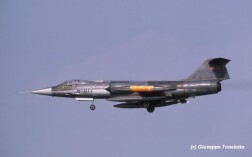 This month the German Air Force JG71, based at Wittmundhafen AB, flying the F-4F Phantom, exchanged with the Italian Air Force 9 Gruppo based at Grosseto, flying the F-104S-ASA. It was a 2-way exchange. Only three Italian Starfighters flew to Germany which were seen on April 20th: MM6733 code 4-22, MM6771 code 4-16 and MM6828 code 4-6. In total four Italian Starfighters from 18 Gruppo based at Trapani-Birgi AB exchanged with Belgium Air Force 350 Squadron (1 Wing) at Beauvechain AB, flying the F-16A Falcon. 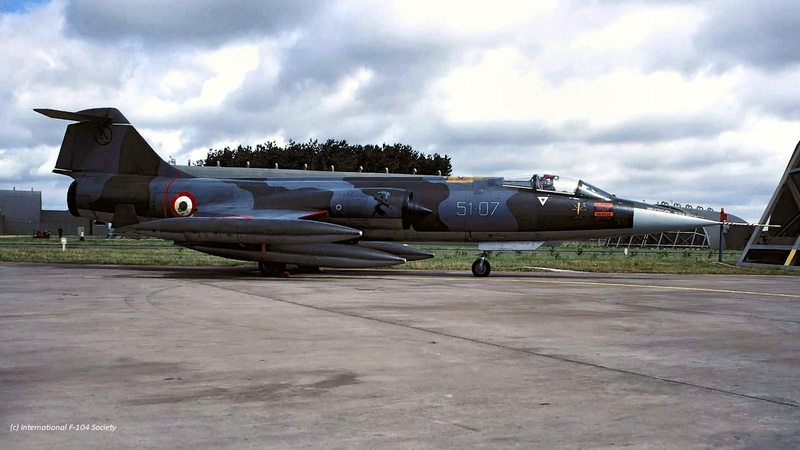 Participating aircraft in Belgium were MM6760/37-01, MM6749/37-15, MM6846/37-16 and MM6909/37-23. It is unknown if also the Belgium F-16s flew to Italy. Beneath two photos taken at Beauvechain by Riccardo Vestuto on May 3rd. 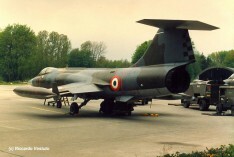 This month the Belgium Air Force 23 Smaldeel, operating the F-16A from Kleine Brogel, exchanged with Hellenic Air Force 336 Mira, flying the F-104G at Araxos. It was a one-way exchange, sadly only the Belgium F-16s flew to Greece. 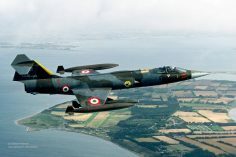 This month the Turkish Air Force 162 Filo (6 AJU), based at Bandirma AB, flying the F-104G, exchanged with the Italian Air Force 21 Gruppo based at Cameri, flying the F-104S. It was a 2-way exchange. 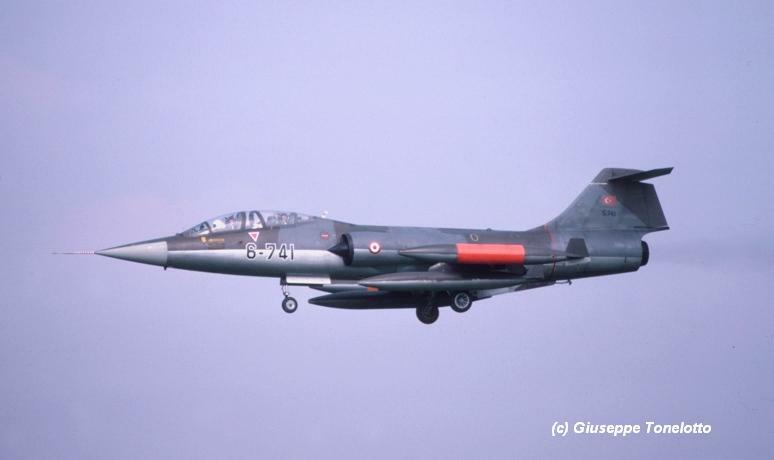 Six Turkish Starfighters flew to Italy being F-104G 7017/6-107, 7032/6-032, 8339/6-339 and TF-104G 5722/6-722, 5741/6-741, 5945/6-945. Turkish transport was flown by C-160D Transall with serial 12-028. 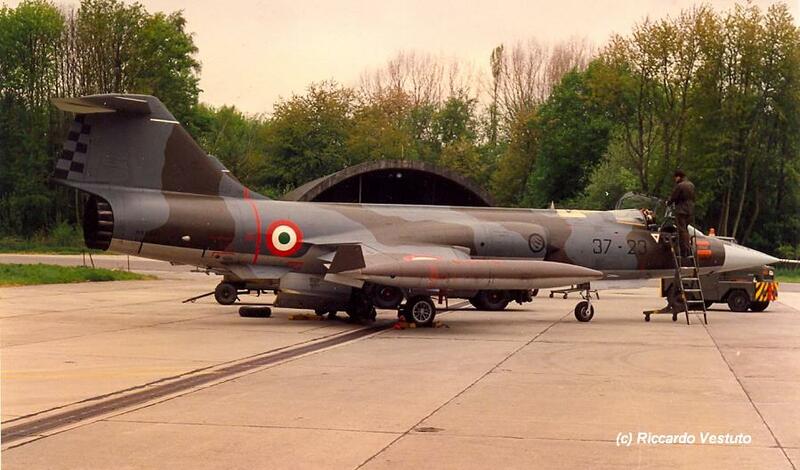 Photos beneath were taken by Giuseppe Tonelotto when the Turkish aircraft arrived at Cameri on 22 May 1988. This month the German Air Force 2nd Staffel / JBG49, based at Furstenfeldbruck, flying the Alpha Jet, exchanged with the Italian Air Force 20 Gruppo based at Grosseto, flying the TF-104G. It was a 2-way shifted exchange. The Alpha Jets arrived at Grosseto on May 24th or 25th. On May 31st a tragic accident killing Major Piero Vidale and Serg. Magg. Giovanni Montagna inside TF-104G 4-28 the exchange mood changed. 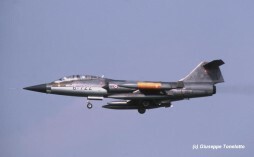 The planned farewell party on wednesday June 1st was cancelled and the AlphaJets returned home instead. Only the Sqd. CO and one pilot stayed for the memorial service. On 26 April 1988 three TF-104Gs MM54233/4-30, MM54254/4-36 and MM45258/4-40 arrived at Furstenfeldbruck for a pre-visit. They stayed the night at Fursty. 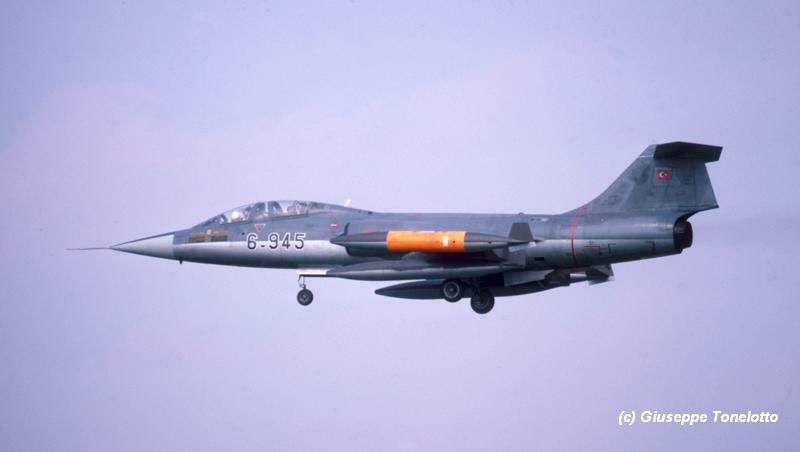 Participating TF-104G during the exchange itself were MM54235/4-31 (from 7-16 June), MM54250/4-33 (from 10-16 June), MM54254/4-36 (from 7-16 June), MM54258/4-40 (from 9-16 June) and MM54260/4-41 (on 7 and 8 June). Transport was taken care for by G-222 MM62102/46-20 on June 7th and G-222 MM61998/46-21 on June 8th. 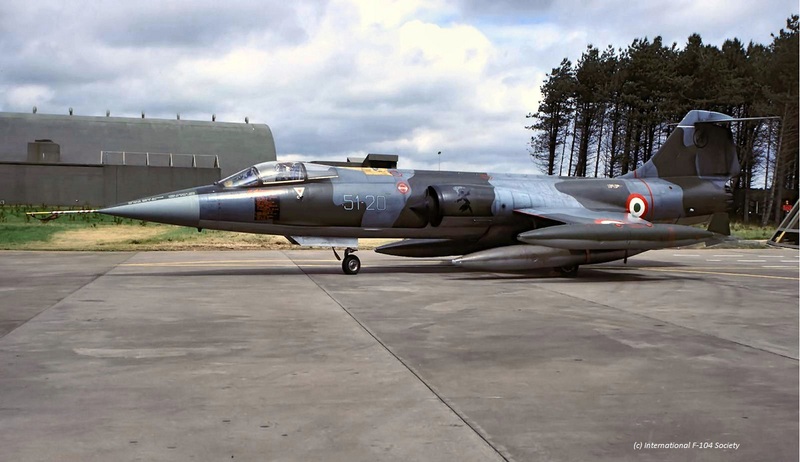 In total four Italian Starfighters from 22 Gruppo based at Istrana AB exchanged with Royal Air Force 111 Squadron at Leuchars flying the Phantom FG.1 fighter jets. The participating Starfighters, which flew via EDAB, were MM6879/51-03, MM6716/51-06, MM6876/51-07 and MM6819/51-20. All aircraft departed from Istrana on July 11th. In total four Phantoms flew to Italy as well on the 11th. Interesting detail is the fact that while on exchange at Leuchars, two F-104s went to Keflavik (Iceland). Photos beneath show aircraft 51-07 and 51-20 at Leuchars (sadly unknown photographer). This month the Royal Air Force 15 Squadron, flying the Tornado GR.1, based at Laarbruch, exchanged with the Italian Air Force 102 Gruppo based at Rimini, flying the F-104S. It was a 2-way exchange. 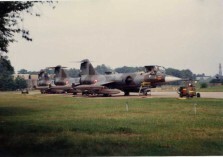 Participating Starfighters seen at Laarbruch were MM6796/5-15, MM6833/5-11, MM6910/5-04 and MM6944/5-03. Transport was flown by C-130H MM62001/46-15. 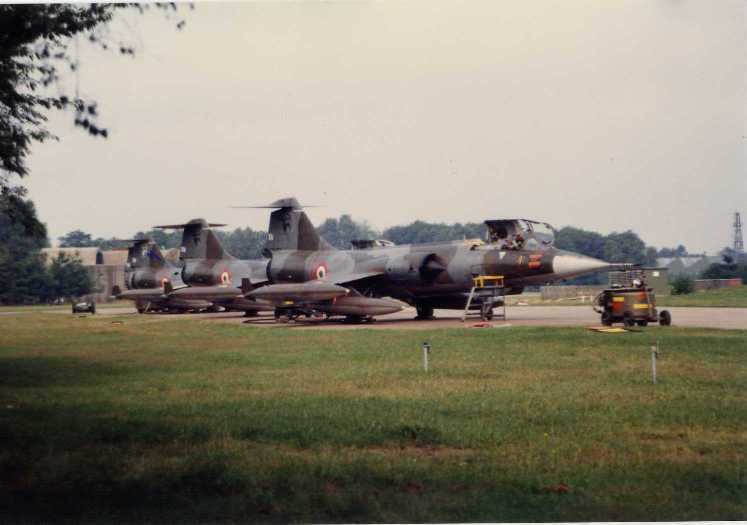 One month earlier 2 aircraft paid a pre-visit to Laarbruch. These were MM6788/5-02 and MM6796/5-15 which landed May 30th and departed again on June 1st. All aircraft received a typical 15 Squadron zapp "XV" on their lower rudder area. 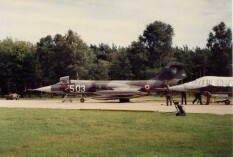 Beneath two photos, one of the line up and one of aircraft 5-03 showing clearly the XV zapp. 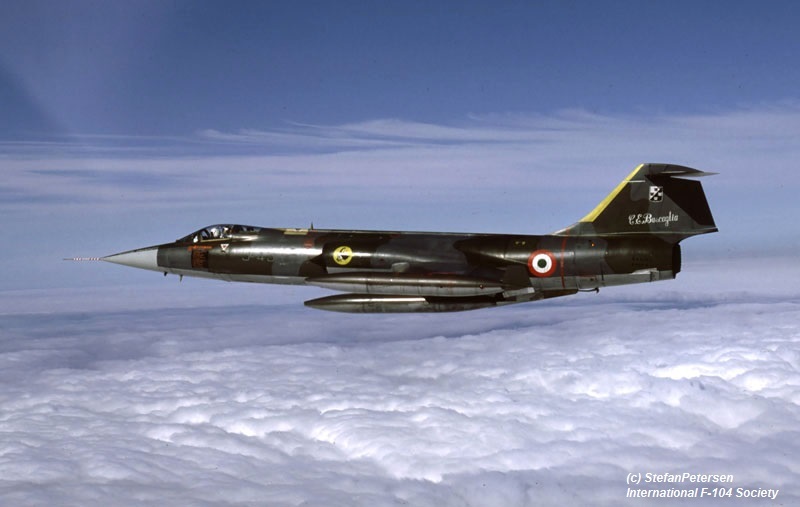 This period the Royal Air Force 43 Squadron, flying the Phantom FG.1, based at Leuchars, exchanged with the Italian Air Force 10 Gruppo based at Grazzanise, flying the F-104S. It is unknown if it was a 1 or 2-way exchange but at least the Italian Starfighters flew to the UK. 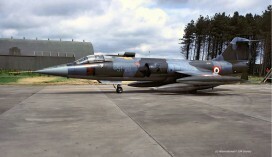 Participating aircraft seen at Leuchars included MM6727/9-40, MM6878/9-41, MM6762/9-42, and MM6769/9-52. 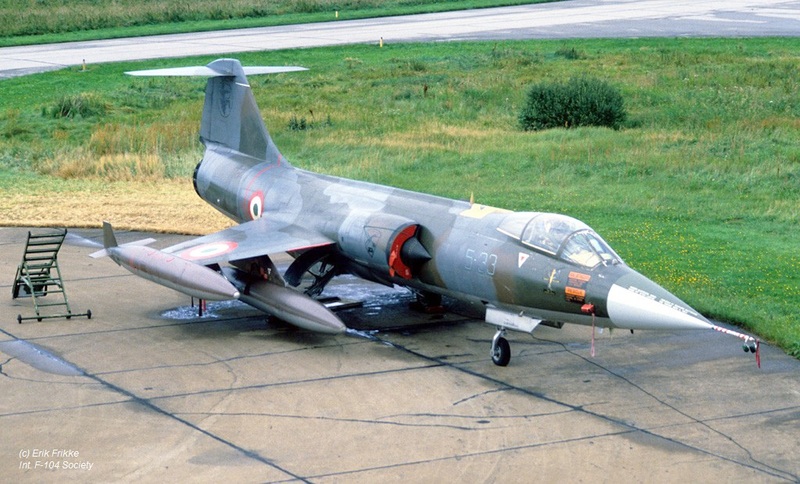 On 29 July two other F-104S aircraft arrived as replacement for two of these four aircraft. These were MM6737/9-33 and MM6719/9-50. 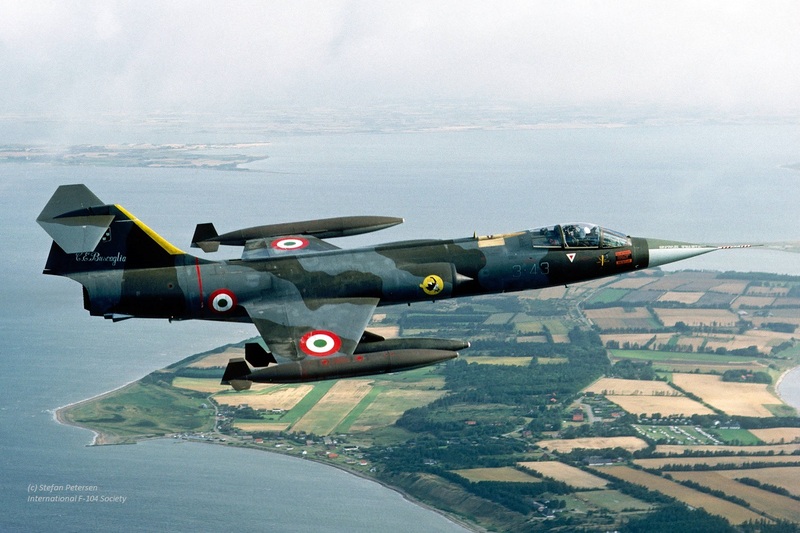 This month the Danish Air Force 726 Eskadrille, based at Aalborg, exchanged with the Italian Air Force 23 Gruppo based at Rimini, flying the F-104S. It was a two-way shifted exchange. The Italians were seen in Denmark in August while the F-16A's flew to Italy in September for their shift. 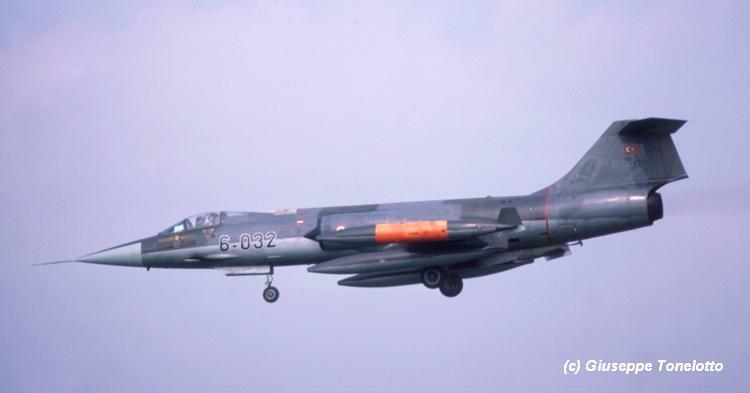 Aircraft at Aalborg, which flew via Bitburg on their way to Denmark, were F-104S/ASA MM6708 code 5-43, MM6776 no code, MM6787 code 5-42 and finally MM6933 with code 5-33. These aircraft received 726 ESK badges on their tails, also seen on August 24th. 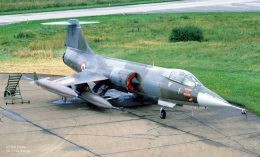 Nice photo beneath was taken by Erik Frikke at Aalborg, this aircraft was lost in an accident shortly after the squadron exchange, September 5th, 1988. This month the Spanish Air Force ALA 21 at Moron, flying the SF-5A, exchanged with the Italian Air Force 12 Gruppo based at Gioia del Colle, flying the F-104S. It is unknown if it was a 1 or 2-way exchange.